JTI’s 2018 Derek Sheckman Award recipients: Haley Lakind, Arly MackRosen, and Kevin MacDonald. JUNE 21, 2018 – Arly MackRosen is about to continue a legacy through food. A junior from Marblehead, MackRosen’s earliest memories include helping in the kitchen. She has a passion for the traditions and community surrounding the preparation of food and, as one of three 2018 Derek Sheckman Teen Leadership Award recipients, she is going to help others build the same kind of strong community in which she was raised. MackRosen’s project is part of the Sheckman award she received from the Jewish Teen Initiative, based in Marblehead. The award recognizes outstanding teens in the Jewish community and challenges them to make the world a better place through a service project. It’s named in memory of Derek Sheckman, who won the North Shore Jewish community’s first teen leadership award in 1996. In 1998, the Swampscott High graduate, 18, succumbed to cancer. 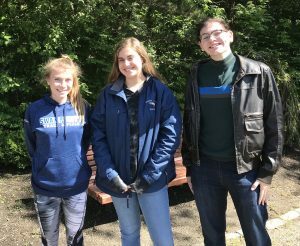 The 2018 Sheckman Award recipients are MackRosen; Haley Lakind, a junior from Swampscott; and Kevin MacDonald, a senior from Beverly. MacDonald wants to help his community do something about trash. He will soon launch his Beverly Bring Your Own Bag Project to help ease his community’s transition away from single-use plastic bags that hurt the environment. “I’ll create posters, stickers, and reusable bags that businesses can display to show that they are plastic-bag free, and make free reusable bags out of donated fabric and T-shirts,” MacDonald said. Lakind received her Sheckman Award for her project called ITS: Inclusion Through Service. Lakind will place special needs students in local service activities and provide real-life experience with student assistants by their side. Lakind’s community service has included building in New Orleans and Nicaragua. She participates in discussions about women’s rights and in the Innovators Club, an inclusion program at Swampscott High School for students with special needs and other disabilities. Last year’s Sheckman projects were no less diverse than those in 2018, featuring projects that addressed Muslim-Jewish relations, LGBTQ inclusion, and teaching tolerance. Emma Mair, one of three 2017 Sheckman Award recipients, has been working on creating a program to foster Jewish-Muslim relations in the community. “Although discrimination has occurred for centuries, in the wake of the 2016 election both Jews and Muslims find themselves facing even more bigotry,” said Mair, 17, who is Jewish and from Middleton. Mair is launching a multi-week course this fall for adolescents and adults to facilitate healthy dialogue between Jews and Muslims on the North Shore. The other two 2017 award-winners were Sophia Smith and Averi Kaplowitch, both of Marblehead. Smith is partnering with NAGLY (North Shore Alliance of GLBTQ Youth) to build positive connections between the LGBTQ community and religious organizations to end discrimination. “My goal is to teach young people on the North Shore that the two communities [Jewish and LGBTQ] don’t have to counter each other, and that you can be religiously observant and an ally to the LGBTQ people,” said Smith. Kaplowitch worked to promote acceptance. Using her award idea as her senior project, she created a training program with a club at her school called Team Harmony for middle schoolers to understand prejudice and discrimination. “My vision is that Team Harmony students will train middle school students to become more effective in dealing with issues of tolerance and diversity,” said Kaplowitch. Sheckman award winners are nominated by community members and receive up to $1,000 in seed money for their projects. Past Sheckman projects include organizing a local Habitat for Humanity project; creating an anti-bullying program; expanding an Anti-Defamation League program in local schools; and coordinating visits to assisted living facilities. For more information, visit https://jewishteeninitiative.org.